It is important to know where the tribes of Israel migrated to because in order to be able to make any sense out of the many prophecies about what will happen to national Israel just before Christ's return, it is necessary to have some understanding of who and where the tribes of Israel are today. 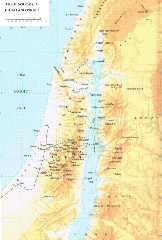 The names of the land are modern names we can all lookup on the map to see where Israel is today. Levi Scattered among other Israelite nations. Simeon Scattered among other Israelite nations. The Apostles were sent first to preach to the tribes of Israel, and then to the Gentiles. Now lets take a look at where the Apostles travelled so that we may determine the distance the tribes travelled and where they ended up. 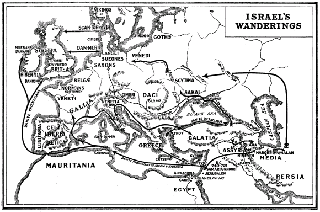 As we can see, due to persecution and being ran out of their land, the tribes of Israel travelled some great distances to ensure safety for themselves. It is also, in my oppinion, fair to suggest that Christians are in fact Jewish peoples. Regardless the name of the religion, God calls His people Israel. Jesus Christ came to round up His people, Israel, and bring them back to the Truth as many have gone astray. It was not until after His death that followers of Christ were given the title of Christian. Upto that point, they were still calling themselves Jews. Either way you look at it, Christians and Jews alike are of the same brethren, Israel. Going by immigration to the United States of America, I believe it is fair to conclude members of each tribe of Israel reside in the United States. The twelve tribes of Israel are named after the sons of Jacob (Jacob was renamed Israel in Genesis 32). Levi, though one of the sons of Israel, is usually omitted from Biblical passages listing the tribes. This is because the Levites were priests consecreated to serve God. Instead of giving them an inheritance of land in Palestine, God gave the Levites the tithes and offerings paid by the other tribes of Israel (Numbers 18, etc.). The Kingdom of Israel, also known as the Northern Ten Tribes of Israel, is composed of the tribes of Asher, Dan, Ephraim, Gad, Issachar, Manasseh, Naphtali, Reuben, Simeon and Zebulon. The Kingdom of Judah, also known as the Southern Kingdom, is composed of the tribes of Judah, Benjamin and the priestly tribe of Levi. Not all Israelites are Jewish. In the Bible it speaks of the division of tribes. Parts of the tribes that made up the Kingdom of Judah left their belief in God to worship idols. And he fortified the strong holds, and put captains in them, and store of victual, and of oil and wine. And in every several city he put shields and spears, and made them exceeding strong, having Judah and Benjamin on his side. And the priests and the Levites that were in all Israel resorted to him out of all their coasts. For the Levites left their suburbs and their possession, and came to Judah and Jerusalem: for Jeroboam and his sons had cast them off from executing the priest's office unto the Lord: And he ordained him priests for the high places, and for the devils, and for the calves which he had made. And after them out of all the tribes of Israel such as set their hearts to seek the Lord God of Israel came to Jerusalem, to sacrifice unto the Lord God of their fathers. So they strengthened the kingdom of Judah, and made Rehoboam the son of Solomon strong, three years: for three years they walked in the way of David and Solomon. So you see some Israelites became paganistic. Many pagan beliefs spawned other faiths, including Islam. Mohammed chose Allah, the moon god, because that was his favorite of the 360 gods his family and society worshipped. Though he had much influence from the Catholics in the region as well. So it is very possible that many participants of other faiths, including Islam, are Israelites. They need to hear Gods Word so that they may be saved and come home to the Father. Islam is the religion of Satan (as pointed out in the article "the Bible and Islam"), therefore they are rightfully so our enemy as they are not of Israel. However, during the conquest of Islam throughout history many were forced to convert to Islam. Considering this fact, it is fair to suggest a small number of our brethren are held captive in the grasps of Satans counterfeit religion. It is our duty then, to preach the Gospel to any and all Muslims and offer them a safe way out of Islam (as converting out of Islam is punishable by death under Sharia law), and bring our brethren back to God before they end up suffering eternal damnation with Satan and his demons. There are only two types of people on this planet. Gods and Satans. Islam is a false religion that doubles as Satans army. Many believe the battle is only spiritual. The battle is as much physical as it is spiritual. Do not allow yourselves to be decieved. You may have a hard time accepting the information set forth in this article, but that is only because Western Christianity allowed itself to become perverted. There is only but one Truth and one way to be Christian. Before one can understand how to be Christian or what a Christian is, you must know and understand the roots of Christianity. That is the purpose of this and future articles, Spiritual Messiah Ministries, and the Spiritual Truth movement; to return Christianity to its roots and save our brethren from paganistic views and falsehoods. As a Christian minister it is my duty to lead spiritually and I am doing my best as Jesus Christ leads me. It is a belief of many that today is a day of memory and not service. They say this in opposition to Mr. Obama's call to service. I agree. It is a day of memory and prayer on this 10th anniversary of 9/11. How many people remember where they were on 9/11/01? I was sitting in my classroom in High School. I was in 11th grade. I was in Public Speaking. The teachers were told to turn on the news. That was the strangest moment in my life. They were talking about the first plane hitting the tower. Then out of no where you see the second one come in from the side of the screen. I was left speechless. That day was the first day I have ever heard complete silence throughout the entire building. I wanted to believe I was watching a sci-fi film. Now I had just recently took interest in politics prior to 9/11. I knew a little about what was going on in the mainstream. I was also a conspiracy theorist. I have always looked at the mainstream as well as the not-so mainstream to determine what is really going on. That day I went extreme with politics, news, theories. I became a news junky after 9/11. I also remember my dad, a truck driver with UPS, telling me his story. He was at the WTC dropping a package just before the attack. He said he was on the bridge heading back toward Long Island, when he heard a loud explosion. He looked into the rear mirror on the side of the truck. Saw the smoke erupting from the towers. Do any of you remember where you were? Do your children know about 9/11? And its importance? Mainstream is telling us it was an attack by "radical" Islam. Mainstream is telling us we are winning. The fact of the matter is there is no such thing as a moderate muslim. All muslims follow the same Qu'ran and follows Sharia law. The Qu'ran tells muslims to kill all infidels. Ladies and gentleman, we are those infidels. In a nation that follows Sharia law there is no room for the U.S. Constitution. We are losing this war. And we will continue to lose unless we stand together. They are on whats called a jihad. We are witnessing a demographic jihad, which is an attack by immigration and reproduction leading to infiltration of politics and displacement of the nations original culture; and a war jihad, meaning they want to keep us overwhelmed with fear as they kill us off. Many politicians have led many citizens to believe we are a secular nation. Fact is we are a Christian nation. Our Constitution, Founding Fathers, music, and morals eminate this fact; as explained in numerous articles on http://spiritualmessiahministries.org The muslims also realize we are a Christian nation. Proof of this was 9/11. They werent attacking us as a secular nation that they could easily over-throw via demographic jihad alone. They were attacking the last and strongest Christian nation left on Earth, that is also home to a strong and vibrant Jewish society, and the protector of Israel. In the Qu'ran America is Big Satan and Israel is Little Satan. By practicing Islam, the muslim has a duty laid before him by Allah to destroy us and dominate the world. The muslims who attacked on 9/11 were rather intelligent. They knew if they could destroy international commerce as well as bring pain to America, the entire West would fall. They first tried in the early 1990's and failed. In 2001 they succeeded. Ten years later we are still feeling the pain. The wound emotionally as well as economically is still wide open. We lost 3,000 lives that day. They will never be forgotten. We always keep in mind that though they are gone from the flesh, they are still upon us in spirit. It wasnt until i began watching memorial videos that i realized, 10yrs later, how i am still affected. The only thing that has changed for me in the past ten years, is that i now know the truth. I wont go into everything just yet as much of it seems to be conspiracist at first. Google 9/11truth and watch the film Loose Change. Those two simple acts will bring to light much hidden truth that was cloaked in lies and deception to this day by our own government. Our enemy is Islam. It is a dangerous ideology that perfectly fits the description of the beast in Revelations. Islam is literally of Satan. Many muslims follow Islam legitimately but many are forced converts and others are brainwashed by muslim apologetics. As long as America is standing and Christians and Jews are within her borders, followers of Islam will continue to attack us in one way or another. As Christianity and Judiasm is becoming outlawed and pushed out of America, we must never forget those who died on 9/11/01 and who was behind their murder. We must also stand together and stand strong. Jesus Christ will be returning soon and we will be re-aquainted with those who died. Those responsible for the deaths of all the innocent Americans who died on 9/11 will be left to burn in hell. No matter what the government, media, or muslim propaganda and indoctrination in our schools state to be fact, we know Truth. That Truth is Jesus Christ is the only way to salvation, America was born a Christian nation and will die a Christian nation, 9/11/01 was an attack and act of war on America and Christianity not just a tragedy, and the enemy is Islam. The souls of those who died will never be forgotten. The enemy will continue attacks both foreign and domestic. As we go day to day we must keep them alive in our hearts. We must never turn our backs on Christ. We must not allow their deaths to be in vain. We must not allow the enemy now nor in the future to win this war. Be forever vigil. Now I ask you to pray with me. 9/11 was a tragic day. Many have died innocently. Others courageously. The Spirit of Christ was surely with the passengers of Flight 93 and all the first responders who put themselves before others to help those in trouble. May we never forget. May their souls continue to live eternally with God the Father and Jesus Christ. May peace be upon their souls forever. May those who caused this and future attacks be brought to justice before God. In the name of Jesus Christ, let us pray. Amen. May all those who died on 9/11/01 Rest In Peace and may God Bless America. Obama is attempting to take control of Christian organizations. When he realizes he cannot do so under the U.S. Constitution, he will do away with the constitution and make Christianity illegal. He has already determined and publicized via DHS that terrorists are Christians. Which means the founding fathers were terrorists. You and I are terrorists. American patriots, working middle class, white males are terrorists. Christianity illegality is around the corner lest we stand up now.